What a fantastic Summer – not because of the ‘wonderful’ weather but because of the Olympics and Paralympics. It was great to see such a pride in all things British and in the determination and success of all our athletes. It is also great as far as we are concerned to see what a huge swing back there has been to customers sourcing UK made products over the last few years. We have been experiencing a massive growth in the demand for our products which has led us to looking for new ways to streamline and improve our manufacturing processes. Terry, working on the new fabric laying up machine used for cutting up the rolls of cloth in to cut pieces ready for printing. Our two most recent purchases have been in our fabric cutting department. 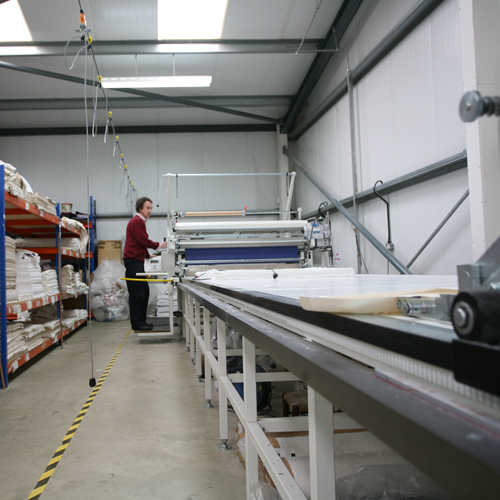 We purchased an automatic laying up machine a few months ago which has helped us keep up with the ever-increasing demand for cut pieces for printing tea towels, bags, aprons and kitchen textiles on our large format automatic direct screen-printing carousels. In the last month we have also purchased a clicker-cutter for cutting individual shaped items such as oven mitts, aprons, bag handles etc. This is proving a great help in speeding up these previously time-consuming jobs in our sewing unit. Our next incredibly exciting purchase (which is being delivered and installed at the end of this month) is a large format digital textile printing machine. The Aeoon machine heralds a new era in digital textile printing and will be the first machine of its type to be installed in the UK. It achieves the highest print quality using a new type of printing similar to an ink-jet printer but on a much larger scale and using many more print heads. 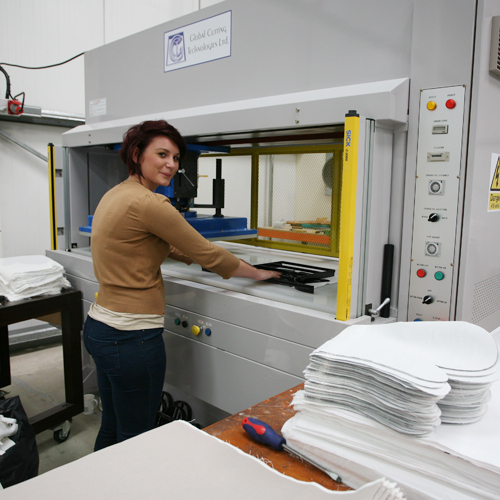 The Aeoon is also capable of printing very large format panels so we will be able to offer our whole range of tea towels, aprons, bags, oven gloves and t-shirts and well as very low minimum quantities and minimal set-up charges. We will be publishing an article and pictures on the blog just as soon as it is installed. Well, we are also planning to build a new large extension on to the factory so we can expand our sewing unit considerably. When finished, this will enable us to bring our lead times, which have become more extended due to the huge amount of work currently in hand, back down to their historical levels. This should be good news for everyone. Anyway this is all the latest news – we’ll be back soon with more on the digital revolution that’s heading our way.